GMO – Genettically modified organism. an organism that has been genetically altered in some way . A GMO, or Genetically Modified Organism is a species that has had it’s DNA altered using the techniques of genetic engineering. A classic example is the production of human insulin by bacteria. This bacteria is a GMO that has been achieved by transferring the human insulin gene into the plasmid of an E.Coli bacteria. DNA restriction enzymes – cut the DNA, so that the required gene can be removed. 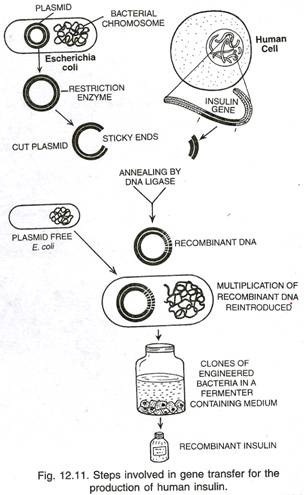 DNA ligases – joint fragments of DNA together, allowing the transferred gene to be joined with the genetic material of a plasmid (this is called annealing, and the cut ends are called ‘sticky ends’ because they include unpaired DNA bases). Task: Make a summary handout illustrating the stages in genetic engineering, and emphasising the role of the enzymes. Use another example of genetic engineering from your research, but following the same steps as in recombinant insulin in E. Coli. Genetically modified organisms are a highly controversial topic not just in Brazil, but worldwide. Claims and risks about GMOs can be divided into environmental, agricultural, and health issues. mutations may cause transferred genes to have unexpected effects.